In his second year at the Agricultural Campus, Keenan Kavanaugh is gaining knowledge that has already influenced positive changes at his family’s potato farm. As the son of a sixth-generation potato farmer, Keenan Kavanaugh’s heart and mind are never far from the farm. 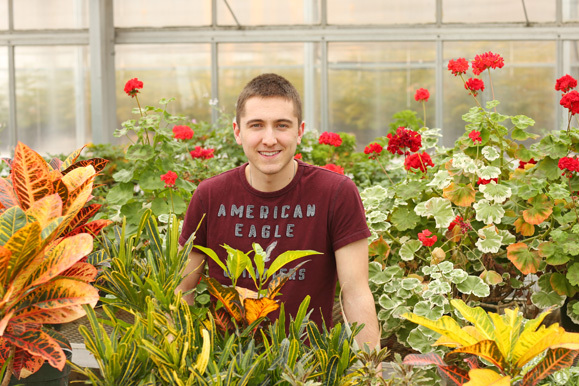 For the second-year Plant Science student, studying at the Faculty of Agriculture marks the first time he’s been away from his family’s potato farm, Thomas Kavanaugh & Sons, in Grand Falls, NB. And while he misses it, university life is suiting him just fine. In fact, Keenan has already made a recommendation that could be a long-term solution to producing healthier potatoes. “On a trial basis, I suggested that we use an alternative to our current rotation crop. The goal is to have it serve as a biofumigant and reduce soil borne pathogens to improve and lessen potato defects. In March, Keenan was one of a handful of young farmers from New Brunswick invited to theCanadian Young Farmers Forum in Vancouver. The national conference brings young farmers together, increasing their knowledge in agriculture and developing leadership skills for their future careers. Whether it’s in the classroom or the field, Keenan’s drive, tenacity and commitment to farming are clear.